● Aric Almirola was sent to the rear of the 40-car field for an unapproved body modification after inspection. ● The Round of 8 contender was able to work his way up to 10th to finish the stage. ● He raced his way into the top-20 by lap 26 and was inside of the top-10 by lap 53. ● The No. 10 Smithfield Ford Spirals team executed an excellent stop at the end of the stage, earning two spots on pit road prior to Stage 2. ● Almirola started Stage 2 in eighth and ended it in sixth. ● The Tampa native started Stage 2 strong but began to battle a “tight and chattering” condition shortly into the run. ● The Smithfield Spirals team pitted for a scheduled green-flag stop on lap 134 for four tires, fuel and adjustments. As the field cycled through stops, Almirola was running in the sixth spot. ● After Stage 2 Almirola pitted for four tires, fuel and adjustments to help with lateral grip. ● Almirola started the final stage ninth and ended it in the eighth position. ● With less than 100 laps to go, Almirola raced his way inside of the top-five. 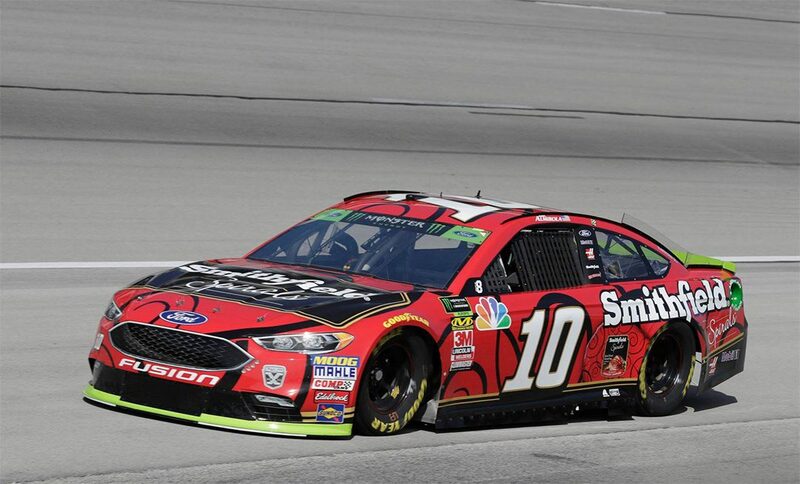 ● The Smithfield Spirals Ford team was the first out of all the playoff contenders inside the top-10 to make a scheduled, green-flag stop on the lap-278 cycle. The crew serviced the No. 10 with four tires, fuel and light handling adjustments to assist the balance. ● With just over 30 laps remaining, Almirola was shuffled back a few spots after restarting third and ultimately finished eighth. ● This was Almirola’s 15th top-10 finish of 2018. ● Almirola earned his second top-10 in 16 career Monster Energy NASCAR Cup Series starts at Texas. ● Almirola finished 10th in Stage 1 to earn one bonus point and sixth in Stage 2 to earn five more bonus points. ● This was Kevin Harvick’s series-leading eighth victory of 2018 and his second victory in 32 career Monster Energy NASCAR Cup Series starts at Texas. ● Harvick’s margin of victory over second-place Ryan Blaney was .447 of a second.